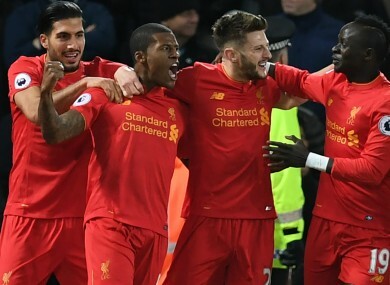 Graeme Souness is positive about the club’s progression under Jurgen Klopp, but believes that they will come short of winning the title. Liverpool are currently second in the Premier League. GRAEME SOUNESS SAYS that Liverpool are unlikely to win the Premier League this season, but is confident that they will secure Champions League football. The Merseyside outfit have lost just two league games out of 20 this campaign and are five points behind Chelsea, who are leading the way at the top of the table. However, Souness, who captained the club during a wildly successful period in the 1970s and 1980s, as well winning the FA Cup as manager in 1992, is not convinced that they have what it takes win the league this year. One of the reasons the 63-year-old does not think the Reds can beat Chelsea to the title this season is the fact that they are losing Sadio Mane — who has scored nine league goals — for the duration of Senegal’s Africa Cup of Nations campaign. “Do they have enough (to win the league) this year? I’m not sure. I think they can get top four,” Souness said, speaking on Eamon Dunphy’s podcast ’The Stand’. Nevertheless, the former Scotland international has been impressed by the new regime under Jurgen Klopp and is delighted to see that the German coach has Anfield “bubbling” again. “I think he’s (Klopp) a breath of fresh air and he talks a lot of common sense,” added Souness. Email “'Liverpool unlikely to win the league this year'”. Feedback on “'Liverpool unlikely to win the league this year'”.